In 1839, sixteen-year-old John Clark, a native of Ashford England, arrived in Coahoma County in search of lumber for his New Orleans employer. Inspired by the fertile Delta farmland, he purchased 101 acres of land near the Sunflower River in 1848 – a purchase that would later become the business district of Clarksdale. Already a prosperous lumberman, Clark soon became a successful landowner, farmer, and investor. In 1854, he married Eliza Jane Alcorn, sister of James Lusk Alcorn, a wealthy attorney who later became the governor of Mississippi and served in the U.S. Senate. John and Eliza lived in a two-room log house for the first few years of their marriage and started a family, which grew to include ten or twelve children, of whom eight survived to adulthood (seven sons and one daughter). After the Civil War, Clark was better off financially than most plantation owners. This allowed him to continue purchasing large amounts of land. By 1891, he owned 5,000 acres, of which 2,000 were being cultivated. In 1868, Clark set aside some of his land and sold 76 uniform 50-feet by 100-feet lots to residents, creating the community first known as Clarksville. Thirteen years later, when it became evident that a railroad would pass through the area, Clark had the town chartered and incorporated as Clarksdale in 1882. Clark’s relationship with Governor Alcorn, his brother-in-law, assured that the new railroad would pass through Clarksdale instead of along the Mississippi River. As a result, the newly incorporated town grew rapidly. Aside from founding Clarksdale, Clark operated a sawmill, a brick manufacturing company, a lumberyard, a general store, and two steam gins. He also founded Clarksdale’s first bank, the Clarksdale Bank and Trust Company. Although he was only briefly involved in politics, he took an active role in shaping the Clarksdale community throughout his life. Clark died in 1893 and was subsequently buried in the family plot in Grange cemetery located at the corner of Sunflower Avenue and Martin Luther King Blvd. Descendants of Clark have lived in the Clark House and have remained in the area over the years. In 1859, John Clark hired an architect from his hometown of Philadelphia to design his new home. Clark then hired Northern workers to construct the home, as the Clarks refused to use slave labor. When the Civil War broke out, these workers fled to the North and the home was not completed until after the war. The two-story, five-bedroom main house is the oldest existing building in Clarksdale. The home is a fine example of Colonial Revival architecture, a prevalent style in Mississippi. Colonial Revival architecture involved remodeling antebellum Greek Revival houses into more fashionable, period homes. In the fall of 1916, J.W. Cutrer and his wife Blanche, the daughter of John and Eliza Clark, decided to build their home on the site of the Clark Mansion. Cutrer had the Clark Mansion lifted up on logs and pulled eastward by mules to its present location. The original front of the house still faces west towards the Sunflower River, but its modern entrance faces Clark Street, in what is now the Clarksdale Historic District. The Cutrer Mansion, still standing on the original site of the Clark Mansion, was a favorite mention in several of Tennessee William’s plays. It was recently saved from a planned demolition and has been renovated by Delta State University in conjunction with Coahoma Community College. Tennessee Williams used Blanche Clark Cutrer as a model for Blanche DuBois in A Streetcar Named Desire and Carol Cutrere in Orpheus Descending, and the house is said to have been the model for Belle Reve in Streetcar and for Big Daddy’s house in Cat on a Hot Tin Roof. 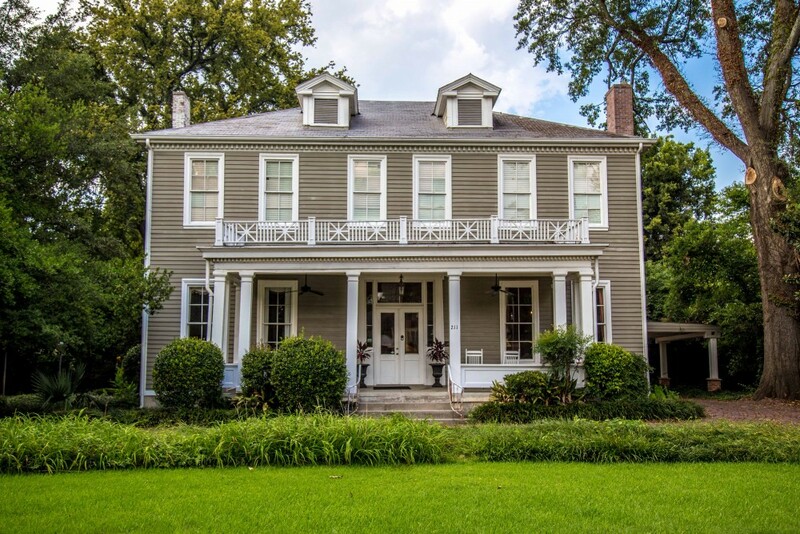 The Clark Mansion remained in the hands of Clark descendants for almost 150 years, until it was purchased from the family and extensively reconstructed and restored in 2001. Though the home had fallen into disrepair, many of the original building materials survived, including the original foundation of walnut and cypress, original pine floors and doors, massive crown moldings and a handsome walnut staircase. The home was placed on the United States Department of the Interior Register of Historic Places in 1992.